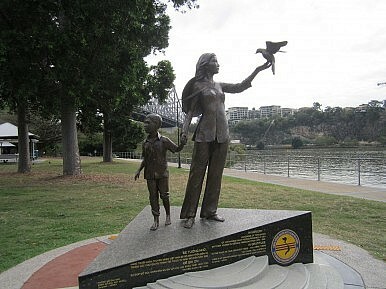 Vietnamese Boat People Memorial, Brisbane. In late April 1976, a small fishing boat carrying five young Vietnamese refugees sailed into Darwin harbor. Although representing the arrival of Australia’s first “boat people,” the Kein Giang’s landing on Australian shores barely made the newspaper. Boat arrivals during 1976 and 1977 were largely met with similar indifference by the national media and political class. The 111 Vietnamese people who arrived during this period were all promptly screened by quarantine and immigration, before being quietly resettled in the community. Forty years on, when Vietnamese asylum seekers arrive in Australian territory their reception couldn’t be more different. Australia’s government now takes a hard-line approach to asylum seekers seated within a rigid paradigm of border protection. Consequently, asylum seekers from Vietnam are represented in significant numbers in the Australia’s immigration detention network. At times in 2014, they were the single largest national group in Australian detention center after people from Iran. After the 1977 election, Prime Minister Malcolm Fraser forged a bipartisan consensus on accepting large numbers of refugees from Indochina despite opposition amongst the general public. Australian immigration teams were sent to camps across Asia to process asylum seekers. Boat arrivals virtually ceased altogether. By 1982, some 60,000 Vietnamese people had been permanently resettled in Australia. More than 200,000 migrants have come from Vietnam since. They constitute Australia’s fifth largest migrant demographic and now represent an essential part of the nation’s multicultural identity. Vietnam has one of the most repressive governments on the planet. Leading international NGO Human Rights Watch has called its human rights record “dire in all key areas.” Political opposition is brutally suppressed, while religious minorities face pervasive discrimination and persecution. Freedom of expression is more or less non-existent, with journalists, bloggers, and activists incarcerated in large numbers. In many ways, the reasons people from Vietnam seek asylum today are similar to those that drove people to escape the country during the 1970s. Ideological opposition to communism, being a journalist or member of a religious minority could have serious consequences for one’s freedom and personal safety. Many that fled to Australia 40 years ago were South Vietnamese nationalists, Catholics, or intellectuals persecuted by the ascendant Communist regime. In the late 1970s and early 1980s Australia’s government welcomed Vietnamese people with open arms, processed them in countries of first arrival across Southeast Asia and flew them to Australia build new lives. Now, they are mandatorily detained under harsh conditions or pushed back to Vietnam by Australia’s Department of Immigration and Border Protection. In April 2015, the UNHCR reported that 46 Vietnamese people were turned back by the Australian Navy after having being screened at sea. Two men and two women amongst this group have now been sentenced to two or three years in jail in Vietnam for organizing the journey. Returned asylum seekers face between two and 15 years’ imprisonment under Vietnamese law. Australia willfully returned these people, knowing this to be the case. A similarity between 40 years ago and now is the political vocabulary attached to discussions of asylum seekers. During the 1977 election the ever-familiar phrase “queue jumper” was coined. This notion of people circumventing the “proper channels” in order to “jump the queue” remains commonplace in contemporary debates. The reality is, for people to take “proper channels” to emigrate to a safe country like Australia, these channels must first exist. Australia needs to process asylum seekers and refugees languishing in Indonesia, Malaysia, and Thailand, and overturn its policy of denying resettlement to anyone who arrived in Indonesia after July 2014. This legislation was intended by Tony Abbott’s government as a deterrent, yet since it was introduced in November 2014 asylum seeker and refugee numbers in our closest neighbor have risen from 10,000 to around 14,000. Australia cannot ignore the reality of forced migration in its region, nor globally. It must again live up to its human rights obligations under international law, and repair relations with ASEAN partners by developing long-term, regional cooperation to deal with asylum seekers in good faith. While Australia, New Zealand, or even Indonesia are safer than the persecution that people seeking asylum are fleeing, they will continue to come to our region. What matters is whether governments choose to welcome or punish them for doing so. Max Walden works for an NGO in Indonesia and is a Research Assistant with the Sydney Asia Pacific Migration Center at the University of Sydney. He has worked with refugees in Australia and Southeast Asia for a number of years.